The Award for Working in High Risk Confined Spaces at level 2 has been developed to allow learners to be assessed against a national standard where they can demonstrate practical skills and provide knowledge evidence that they are capable of working safely in a high risk confined space environment, where a specified hazard may be present. Access may involve complex procedures and there will be work specific controls and rescue arrangements. The use of self-contained open circuit breathing apparatus and all other confined space equipment will be required. Access could be a vertical entry from above or below, horizontally by walking or climbing into the work area using the associated equipment and personnel. This qualification is available through SQA approved centres and training providers. Use the tabs below to open each section individually. Alternatively you can show allopen all sections the sections. 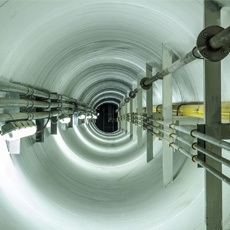 There are a number of serious injuries and fatalities in confined spaces each year in the UK, involving individuals who may be working in a confined space without proper training and equipment. Industries in the UK are required to have fully trained and competent operatives/personnel who are capable of working safely in areas of the workplace which are defined to be a confined space. The Award for Working in High Risk Confined Spaces provides the opportunity to develop or extend skills which should ensure that learners meet the requirements of the Confined Spaces Regulations 1997 Approved Code of Practice and guidance. The Unit specification that makes up the Level 2 Award for Working in High Risk Confined Spaces has been designed to match the requirements of the Energy & Utility Skills National Occupational Standard EUSCS03. This qualification is suitable for operatives/personnel seeking entry into, or already working in a job which may involve entering a confined space. As with all SQA qualifications, entry is at the discretion of the centre. To achieve the Award for Working in High Risk Confined Spaces, learners will need to successfully demonstrate their practical skills through the completion of practical assessments. Learners will also have to demonstrate that they possess the underpinning knowledge needed to understand how to deal with any problems or variations that may occur during practical activities. This will take the form of a knowledge assessment. The Award for Working in High Risk Confined Spaces at level 2 requires the learner to complete 1 mandatory Unit (credit value 3). For information on the structure of this qualification, please refer to the Qualification Structure. The unit specification and Training and Assessment Programme for this qualification are available on SQA’s secure website. These are available from your centre’s SQA co-ordinator. For further information, please contact mycentre@sqa.org.uk. On completion of this qualification, you can apply to register with the Energy & Utility Skills Register EUSR.